For two days in March, panelists at a Denver workshop hosted by the Western Governors’ Association repeated the same mantra: When it comes to managing public land, collaboration is key. Many pointed to the Interior Department’s greater sage grouse recovery plan as an example of what can be accomplished when people work together to promote landscape conservation planning and thereby avoid the need for endangered species protections. The plan, finalized in 2015, garnered support from agricultural interests, conservationists, some states and even some oil and gas companies. But under the Trump administration, that same plan is already being reworked. The Bureau of Land Management is currently rewriting the environmental impact statements, and last September, Interior Secretary Ryan Zinke removed some habitat protections. The goodwill that the long negotiations nourished is waning as conservationists try to figure out how to respond. Many in the conservation community now wonder: Can they trust the collaborative process, which they say they support, or should they lean on more heavy-handed tactics, such as Endangered Species Act lawsuits, to attain their conservation goals? Sage grouse on the Curlew National Grassland in southeast Idaho. 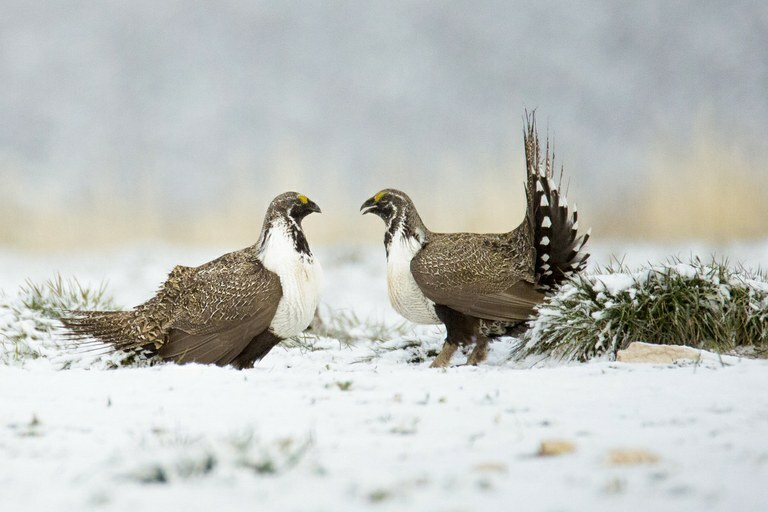 There’s a simple reason why land planners and stakeholders touted the value of the joint effort and sought compromise on sage grouse management: It helped avoid expensive lawsuits and led to more flexible solutions than endangered species protections allow. The 2015 sage grouse plans focused on habitat conservation that limited development in critical habitat areas for sage grouse, but also allowed for oil and gas and mineral development in less important habitat. The collaborative plans also crossed state boundaries, an approach that helps the West’s migratory animals, like pronghorn antelope, and one that Zinke has publicly supported. “Conservation groups are going to be less likely to collaborate unless they see signals from the administration that they will uphold agreements,” he says. Despite this, conservationists still say that the collaborative process is the best way to work on species and landscape conservation, at least at the local level. “We’re still very committed to the concept of maximum participation, having more voices and an open public process,” says Nada Culver, the senior counsel and director of The Wilderness Society’s Bureau of Land Management Action Center. “It’s vital to include the public when talking about public land.” But she fears that’s being lost under the current administration. Although there have been setbacks in federal negotiations, Joy Bannon, the field director for the Wyoming Wildlife Federation, says that participants in Wyoming sage grouse talks are still participating in related projects. For example, the Wyoming Wildlife and Roadways Initiative, a state-level collaborative process, is working to improve wildlife corridors for animals like mule deer. If the conservation community backs away from collaboration, activists are more likely to turn to the pricier strategy of endangered species lawsuits and listing petitions — the exact situation the 2015 sage grouse plans sought to avoid. Zinke has pledged to make a “grand pivot” to conservation in his second year. But that might be too late; the decisions of his first year may have already set those who are willing to collaborate on conservation against him. In fact, in late April, the Audubon Society, National Wildlife Federation and Wilderness Society filed a lawsuit against the federal government for failing to uphold the 2015 plans they worked on and supported.